White Backlash provides an authoritative assessment of how immigration is reshaping the politics of the nation. Using an array of data and analysis, Marisa Abrajano and Zoltan Hajnal show that fears about immigration fundamentally influence white Americans' core political identities, policy preferences, and electoral choices, and that these concerns are at the heart of a large-scale defection of whites from the Democratic to the Republican Party. Abrajano and Hajnal demonstrate that this political backlash has disquieting implications for the future of race relations in America. White Americans' concerns about Latinos and immigration have led to support for policies that are less generous and more punitive and that conflict with the preferences of much of the immigrant population. America's growing racial and ethnic diversity is leading to a greater racial divide in politics. As whites move to the right of the political spectrum, racial and ethnic minorities generally support the left. Racial divisions in partisanship and voting, as the authors indicate, now outweigh divisions by class, age, gender, and other demographic measures. 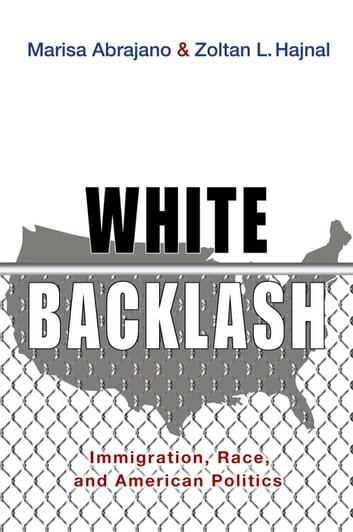 White Backlash raises critical questions and concerns about how political beliefs and future elections will change the fate of America's immigrants and minorities, and their relationship with the rest of the nation.